Bluejay/ Piney Woods / Camp Chase - Hog Eyed Man / Santa Anna's Retreat - John Lover's Gone - Flying Indian - High Dad in the Morning / Fine Times at Our House - The Little Carpenter - Demicentenary Blues - Coal Creek March / Pay Day at Coal Creek - Liberty off the Corn Liquor Still - Johnson Boys - Hatton Woods - Cattle in the Cane - Tiftie's Annie - Duchess - The Conundrum - The Lady Gay - Elzick's Farewell - Teardrops Falling in the Snow - New Lost Train Blues. Kate Lissauer's music, as her own liner notes tell us, "is rooted in the Appalachian Mountain and old time country music traditions." Her father was a clawhammer banjo-picker from Louisville, Kentucky. She grew up surrounded by recorded and live music, and began experimenting with her grandfather's fiddle in her teens. After leaving university, Kate spent some time absorbing Appalachian music in West Virginia, before forming a string band in Baltimore. An extended stay in Scotland, where she played and recorded with the Caledonia Ramblers, added another dimension to her repertoire. 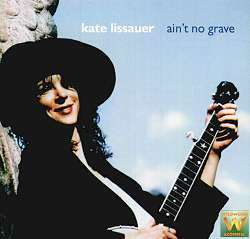 Kate now lives and performs in London, where this album was recorded in 1998. For me, its two outstanding tracks are the title song - a rousing gospel piece from the repertoire of Estil C Ball - and the vibrant Coal Creek March / Payday at Coal Creek, recorded by Pete Steele in the 1930s for the Library of Congress, and popularised by Pete Seeger in the '60s. Both pieces feature a good blend of voices and instruments, and are delivered with irresistible enthusiasm. I was less happy, though, with Kate's rendering of the Scots ballad Tiftie's Annie. This is one of the grimmest of the 'muckle sangs', and it demands a bigger, bolder voice to sustain its dark and passionate narrative for a full six minutes. Moreover, the banjo accompaniment imposes a rigid pattern on the verses, when a freer delivery might have been more effective. Understandably, Kate sounds more at home with The Lady Gay - a West Virginia variant of The Wife of Usher's Well. Her singing of this demanding ballad is relaxed and assured, with her fiddle providing a subtle contrast to the vocal line. Other Scottish transplants have taken root more comfortably. The Conundrum is a tune Kate learned from the piper Willie McPhee and arranged for banjo, with the insistent lilt of the 5th-string drone preserving a flavour of the bagpipes. In the end though, it's the Old Time tracks that I keep playing over and over again. The boisterous humour of Johnson Boys, the unashamed sentimentality of Teardrops Falling in the Snow, and the foot-tapping bounce of Cattle in the Cane hit the bullseye every time. As a bonus, the notes offer one more theory about the origins of that widely-travelled favourite the Hog-Eyed Man. The New Deal String Band's latest CD, 'Dealing A New Hand (from the Same Old Deck)' features a bright and breezy variant of this tune. They call it Hog-Eye, and describe it as "primarily an instrumental but with a few verses thrown in." Kate has a different version, with an almost bluesy flavour. She notes that similar words are sung in England as a sea-shanty, which "probably returned to England from America, as the term 'hog eye' is not an English one". She adds that some blues singers use the term, in lines like "I got a girl, she's got something like a boar hog's eye", which sounds promising, but fails to explain how the epithet got transferred to the hog's eye man. Captain W B Whall, in his Sea Songs and Shanties (1910), links this song with the California gold rush, where "there was a great business carried on by water, the chief vehicles being barges, called 'hog-eyes'." But he adds, "The derivation of the name is unknown to me." Stan Hugil, in Shanties from the Seven Seas (1961), agrees with Whall, noting that 'ditch-hogs' was a dismissive term for canal or river boatmen, used by American deep-water sailors. A few years ago, on a visit to the USA, I stumbled over another clue. In the nineteenth century, much of Philadelphia's shipbuilding was done on a large mud-flat known as Hog Island. The rough and rowdy men who worked there were called 'Hog Islanders', or 'Hoagies'. (Interestingly, Kate pronounces 'Hog-Eye' as 'Hoag-Eye' - is that just coincidence?) Long before Philadelphia's last shipyards died in the 1980s, Hog Island had been dredged away to clear the channel for bigger ships. But 'Hoagie' still remains the local name for a large torpedo-shaped bread roll with a savoury filling. Apparently, the Hog Islanders carried them to work in their ... er ... lunch-boxes. This raises some interesting possibilities, but it's time we got back to Kate's CD! All in all, I found it a very enjoyable record, though not an outstanding one. There's plenty of pleasant singing, lots of competent but unflashy fiddle and banjo, a few tasteful interventions on mandolin and harmonica, and some discreetly efficient guitar back-up. Kate and her fellow-performers show a proper sensitivity to the tradition, without letting themselves get trapped by excessive reverence for it. They freshen up better-known songs and tunes with original arrangements, and introduce a few interesting rarities and new compositions to divert the listener. The whole session has an air of easy informality, as if it were recorded in someone's home - which in fact it was. Unfortunately the recording quality is less than ideal, with the overall sound somewhere between mellow and muddy. That's no great problem for the fiddle and banjo, as their strident tones cut through well enough. But Kate's rather delicate voice doesn't always come over as clearly as it should, while Joe's excellent guitar is sometimes reduced to a fuzzy thrumming. Boosting the treble on the amplifier brightened the sound of the instruments, but affected the vocals slightly, causing some of the sibilants to hiss and snap a bit (though this was never a serious problem). Anyhow, better to have a hazy home recording that's full of heart than an acoustically perfect studio job that's spiritually sterile. This is undoubtedly a record with its heart in the right place, and a few minor technical defects are of no great significance. Available from: Wildwood Acoustic, PO Box 12, Carnforth, Lancashire LA5 9PD. Mid-price; running time 73:29.